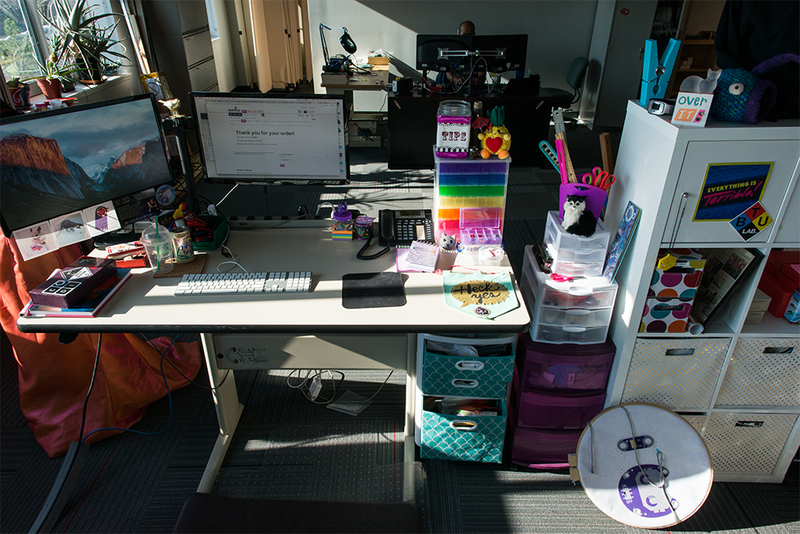 Welcome to a very special edition of Desk of an Engineer featuring a non-engineer! We've been switching things up this month in honor of the 10th anniversary of the LilyPad product line by turning the website purple, and now we're paying a visit to the most purple desk in the office! Angela is the product manager for SparkFun's education products, which include the LilyPad ecosystem. She is also our resident e-textile specialist and wearables guru. My workspace is in a bit of a transition at the moment - I just moved from another part of the building and haven't properly unpacked yet, but I'll give you a tour of what's going on so far. I've divided my area into a few different working spaces - a seating area, crafting space and my computer desk. In the back corner is my favorite part of my space - a rhinestone couch! Being a product manager means I do a lot of collaborating and meeting with coworkers from other departments, so I wanted to have a really fun place for them to hang out while we chat details on projects. I acquired that couch on Craigslist; the prior owner worked at an event company and brought it home when they were cleaning out one of their warehouses. It was made as a prop in a Las Vegas show. 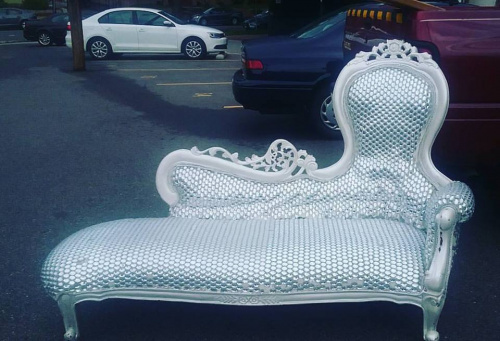 Sparkle couch on the day I adopted it. My partner was kind enough to drive it in the back of his pickup truck all the way from Denver to Boulder, blinding unsuspecting cars along the highway when the sunlight hit it. Tucked away on the sparkle couch is my handmade LilyPad Arduino pillow that made the move with me out to Colorodo when I first joined the SparkFun team in 2013. It was featured on Makezine back when I made it in 2010, and has traveled around with me to Maker Faires and as a fun prop when I teach workshops. Leaning against the back wall are some reversible sequin panels I made, which act as a fun interactive piece of art or message board. They haven't been installed yet, but people have already started to play with them when they visit my desk. 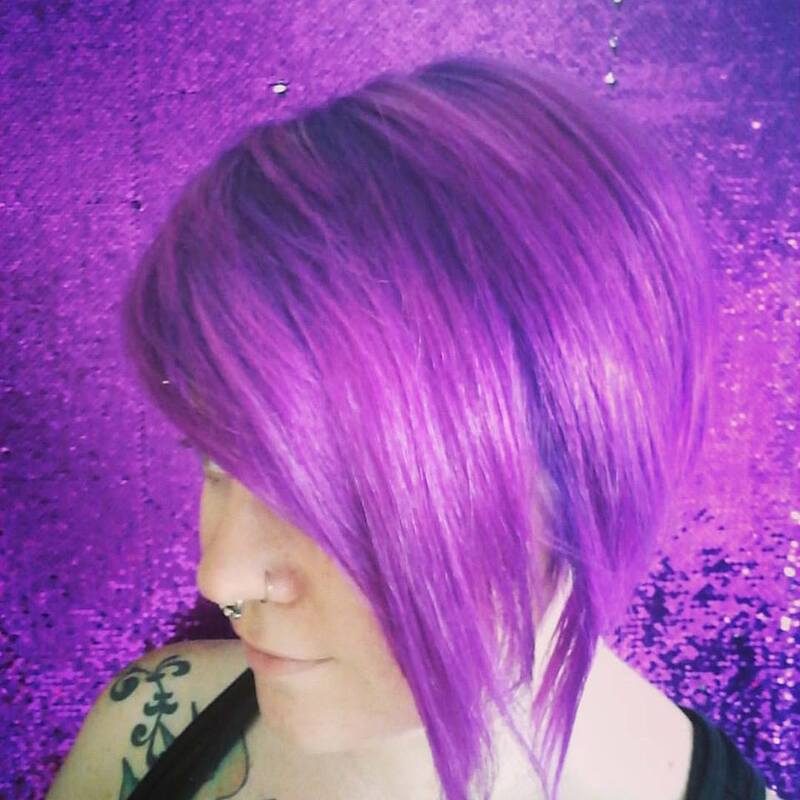 For those of you who know my love of purple, those sequins match my hair color exactly right now, which is fun. Above the panels are some fun Halloween projects made with LilyPad boards. The spiderweb wreath uses conductive yarn as a capacitive touch trigger for a spider's LED eyes. Next to it are some spooky decorations including a snake and skull banner with a LilyMini ProtoSnap, and a spider and pumpkin banner with a LilyTiny. The purple balloons are left over from our LilyPad 10th anniversary/ProtoSnap Plus launch party last week. They lost their float, but are hanging around for a bit as some ceiling art. Next up is my crafting/sewing desk where I do a lot of documentation and project builds, both for our tutorial system and our education channels. Having a table that I can walk around has made a huge difference in my workflow. Here's a detail shot of what I'm up to right now. 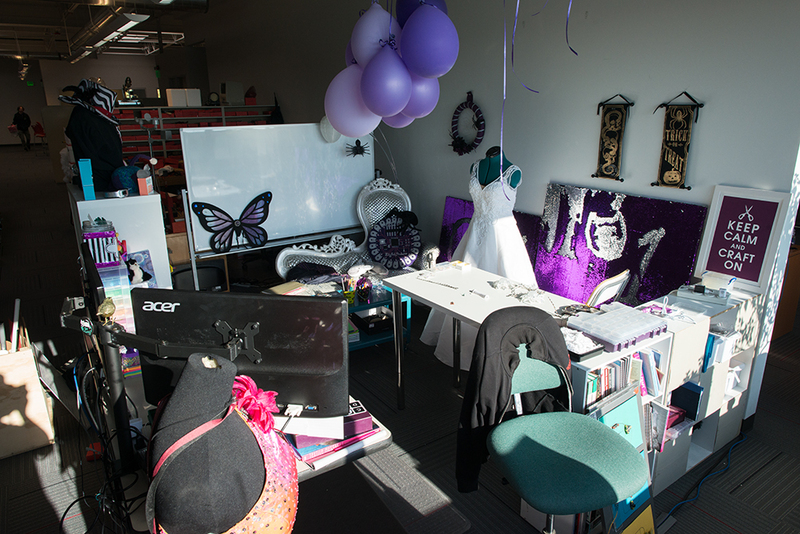 All the things out on the table are parts of my Halloween costume for our office costume party. The white dress on the mannequin has addressable LEDs embedded alongside the beading that will be controlled wirelessly by a 'magic wand' with a color sensor in it, and various fun modes to choose from. You can see some bits and pieces of the wand out on my table at the moment - some LED strips, the casing from a toy wand that I've taken apart to stick a Pro Micro in, and some boxes of LEDs ready to get added to the dress. 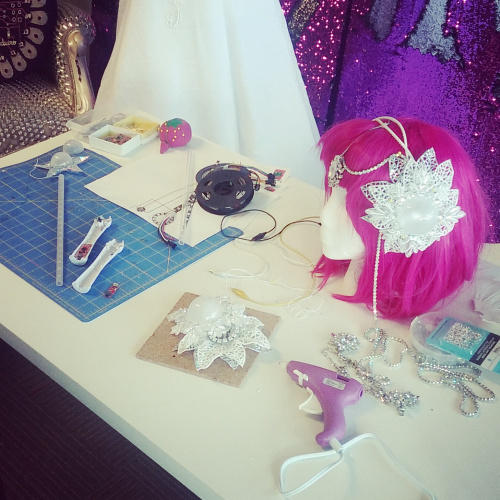 Also on the table are parts to a headpiece I am making that uses some Neopixel Rings underneath floral accessories and in the jewel on the forehead piece, which will also be connected wirelessly to the wand. The cubbies that hold up my table (seen in the first picture) are where I store materials (conductive fabric, felt, sewing supplies) as well as product samples for evaluation for inclusion in our catalog and R&D projects, and a library of books on fashion, technology, crafts and e-textiles. Finally, my computer desk and more storage! Hidden behind my monitors is a light-up prom dress I made as a demonstration of the LilyPad Pixel Board and as an example project for our SparkFun Live prom episode. The rainbow drawers contain some of my most-used items, such as conductive thread bobbins, needles, pins, USB cables, and pens and pencils. The polka dot bins in the bookshelf house all of the LilyPad demo projects and teaching tools I've built over the years and during my time with SparkFun Education before moving into Product Development earlier this year. Leaning against the bins is an oversized LilyPad teaching tool that I use when teaching our introductory Glowing Pin project (learn how to create your own over on the SparkFun Education blog). But wait - where are all the tools?! I actually do a lot of my non-craft project builds at a shared workbench and large work table that aren't pictured here. You may get a look at them in a future edition of Desk of an Engineer that features another member of the Product Development group. Well, that's it. My space will soon settle in to its natural state of chaos as I start to use it more, but until then enjoy this picture from my old space featuring my desk cat Sadie. Hi Angela, a few months ago I participated in the Micro4Ed17 Teachers, and I wanted to ask you about the material you use to explain in the Lilypad workshops, will it be possible for you to share it with me? since we will be working with my girls a small workshop and I loved the way you teach it and the printed material is more visible to explain. Thank you so much for your help!! Hi, glad you enjoyed the session! 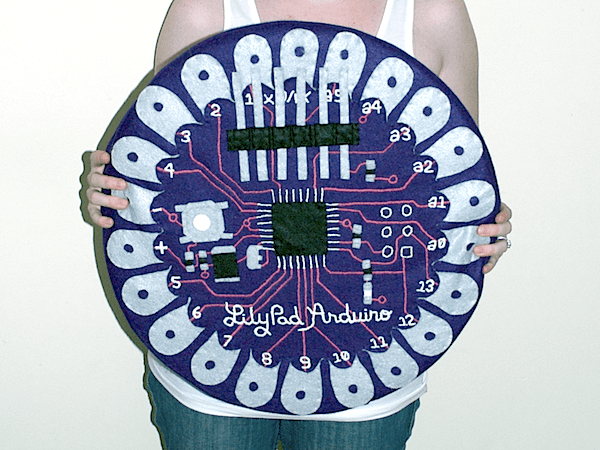 I was using our introductory activity from the LilyPad Sewable Electronics Guide. You can find a full pdf of the guide and the individual activities as online resources here. If you'd like to recreate the teaching demo I use I wrote a blog post on it for SparkFun Education. We also just hosted a webinar talking through the project I demonstrated and some troubleshooting tips for instructors, you can view the archived video on youtube. I thank you so much for your help! !, maybe you could share your mail and so I can send you photographs of what we will do with my girls. My kitty, Notebook, was pleased to see Sadie! She'd felt discriminated against by all of the talk of dogs in the Sparkfun space. Not to worry, there are quite a few cat people here in the office! Just not as many cat visitors, cause they aren't as well behaved as our dogs :). I was lucky to adopt a cat who was chill enough to hang out in my desk while I worked. See another example of my 'desk cat' here. Behold: Our Electrify Your Prom Winners!